The recreation of a riot was practiced over and over again on Wednesday, May 30 for full filming later on Thursday, May 31. Cedartown is downright famous these days. It just keeps showing up on the small screen in all kinds of places, whether it be in television dramas shown during the week, or in the embodiment of the city's greatest talents on Sundays. Whether it was the cityscape playing a role as a setting for somewhere else, or a small town singer getting recognition for his talents on national television, Cedartown was in the spotlight in 2018. So read on for some of our favorite highlights of 2018 in Cedartown, and think back on a year where this corner of the world shined bright. Film crews returned to Cedartown in the past months to use Main Street as a setting for Tulsa, Oklahoma in a forthcoming HBO series bringing back "The Watchmen," but not in the same vein as the famous graphic novel. It looked like a real riot was going on in downtown Cedartown, but it was all just for show. and all day Wednesday and Thursday the crews brought in extras, props, animals and even pyrotechnics to recreate the 1921 Tulsa Race Riot as part of a pilot for a new series. Cedartown was chosen due to the architecture of one of the buildings downtown which closely matched a theater in Tulsa destroyed during the riot. More than 300 extras were brought downtown for filming, and streets were shuttered from midnight of May 30 through midnight of June 1. Most businesses also remained closed for the two-day shoot. Crews came into town on the anniversary of the Tulsa riots that took place right after the Memorial Day holiday in 1921. "The Watchmen" series was later announced for a first season after a pilot episode was completed, with a lot of filming for the series happening right here in Georgia. Macon got a lion's share of the project back in the spring. According to online sources at the time, Damon Lindelof was announced as the director for the HBO series and based on the graphic novel created by Alan Moore. A 2009 movie was directed by Zach Snyder. Cedartown's hosting of film crews made for the latest visit from Hollywood to Main Street. The city was used as a backdrop for the third season of IFC's "Hap and Leonard" in the most recent filming in downtown Cedartown. It prompted the city to pass a film ordinance to control what is and isn't allowed on city property when someone wants to shoot scenes in public spaces, and what permits and costs are involved. The new film ordinance went into place just in time for film crews with Peachy Clean Productions to utilize Main Street. Long awaited fixes to several areas of the city's wastewater infrastructure are finally set to get underway after a year of planning, getting loans approved and seeking contractors to tackle the work needed to ensure that sewage is going where it is supposed to, and coming out cleaner on the other side than when it went in. City Commissioners began the discussion of what to do about wastewater updates earlier in the year, and with the help of low-interest loans from the Georgia Environmental Finance Authority, will be moving ahead on updates to two lift stations, making repairs to equipment at the wastewater treatment plant, and fixing a sewer line on Cave Spring Road. All of this is going to cost city taxpayers $3 million once loans are paid off at 1.25 percent, much lower than what the city estimated they would have to pay for the project's cost over the long term. City officials finished up opening bids in December on the project, which from three different bidders came in at the lowest estimate of $2,282,000 for one portion of the project and another $718,760, which is just under $1,000 for the loan amount. City manager Bill Fann said the slight difference is one the city should have no problems covering, and expects to be able to approve the costs in early 2019 and get work underway. Good weather worked out for the Cedar Valley Arts Festival and the Fall Festival downtown, but didn't quite cooperate when it came time to jam out on Main Street. Cedartown's annual weekend in the spring was for a change bright and sunny weather, allowing local residents to shop for arts and crafts and check out what local school children submitted and was hung on the chain link fence of the tennis court. This year marked the 54th year of the event. The summer weather wasn't as cooperative for Cedartown's annual Wheelchair 5K, Daniel Romanchuk returning to win a second year in a row and beat a record in the process. Romanchuk set a time of 9:40.92 for everyone else to try and beat during the July race. He won the Peachtree Road Race ahead with a time of 18:39.42, then came to Cedartown just before coming to the racecourse on College Street. Susannah Scaroni took first place in the women's division race with a time of 11:37.33. Rain tried to wash out festivities for a second year in a row, and though a crash happened in 2018, the races were still run on time. Wet weather did dampen the spirits of music lovers in Polk County who wanted to come out and enjoy concerts in downtown Cedartown this summer. Two out of the three Fourth Friday concerts were washed out and had to be rescheduled later in the fall in 2018. Downtown did enjoy a Fall Festival in October without any weather issues this year, but it felt more like summer as temperatures rose to 90 degrees on the first Saturday in October. Flooding also proved an issue several times this year, with rain events in the summer and through the fall and into early winter causing waters to rise around the county. During one event, the Cedartown area received more than 9 inches of rain over the course of several days, and one downpour that threatened to flood vehicles in July that brought more than an inch of rain over the course of an hour. Business continued to grow in Cedartown during the year, including one big opening that gives people a reason to shop in the area, and more to come. Cedartown's Tractor Supply opened up in February during chilly conditions in Polk County, and shoppers have enjoyed opportunity to check out the store for many reasons ever since. They've hosted opportunities for kids to come enjoy a small-scale petting zoo inside the store, held raffles, donated money back to 4-H programs and much more throughout their opening year in Polk County. Shoppers looking for a variety of farm supplies can visit Tractor Supply at 1600 Rome Highway. Planet Fitness also joined the community in Cedartown and the new 24-hour gym joins the chain of fitness centers around the country. They opened in May and began offering discounted memberships at their location at 770 N. Main St. transformed the building in the Kroger shopping center over the early months of spring and features a vibrant purple exterior. Another big business announcement of note was the start of construction of the new Cedarstream building out in Cedartown's Northside Industrial Park. Contractors broke ground on the new facility that was expected to be wrapped up as the year was coming to a close and a few days of good weather helped out crews as December came to a close. The company plans to move early in 2019, pending any further delays due to weather. Polk County usually doesn't see a lot of death at the hands of others. Some would consider the trio of murders in Polk County an outlier for an otherwise quiet community when it comes to these kinds of crimes. This year marked what people consider usual for the community as a whole: only a single homicide was reported (as of press time ahead of the holidays on Dec. 22) for the entirety of 2018. It dates all the way back to late June, when police arrested Laryan Yance Walker, of 501 Line St. in Cedartown, for the shooting death of Ronald Morris Bentley on Gibson Street back in the summer. His arrest came after Cedartown police teamed up with the GBI to probe the circumstances of the killing and make an arrest. The 40-year-old Bentley was pronounced dead on the scene at 5:45 a.m., according to Polk County Coroner Tony Brazier, who ruled his death a homicide by shooting. Walker was quickly arrested for the homicide and has since been through court proceedings leading up to a trial set to come in 2019, according to District Attorney Jack Browning. The area wasn't without tragic circumstances this year, though fortunately in the case of two other shootings in Polk County no one was killed. Police are still looking for suspects in those two incidents – one in the Cedartown area, and the other in Rockmart. In the early morning hours of July 9, the driver of a still unidentified silver pickup truck shot newspaper carrier David Gilmore in what police believe was a road rage incident. Though video from one convenience store on South Main Street near where the bypass ends were able to provide surveillance video of the truck and the aftermath of the shooting when Gilmore pulled into the parking lot and sought help, they have yet to be able to identify a suspect. Gilmore went through surgery and recovered from his wounds. As mentioned in the Rockmart Year in Review story, police also don't have a suspect in a similar incident on the eastern side of the county. Mallory McClarity, 50, of a Decatur address, was at 45 Pine Mountain Street in the Rockmart area off Morgan Valley Road in September when he was shot. He drove himself to the Triangle Grocery store parking lot and called 911 for help. Police were unable to develop more information about a suspect following the incident, based on reporting at the time. One fortunate bit of news provided by the coroner as the year was coming to a close: overdose deaths and suicides are on a decline for the 2018 calendar year. Brazier said that the number of suicides his office handled in 2018 was down significantly for the year by at least a dozen, as well as overdose deaths. That could partially be attributed by decisions by local law enforcement agencies to begin allowing officers to carry naloxoline in order to help reverse an overdose. Police cars were the first in line as the Rockmart Christmas Parade turned onto Marble Street, and marked the first time cafe string lights went on over the street. Local residents lined the bank of Euharlee Creek to watch the Rotary Club Duck Race. 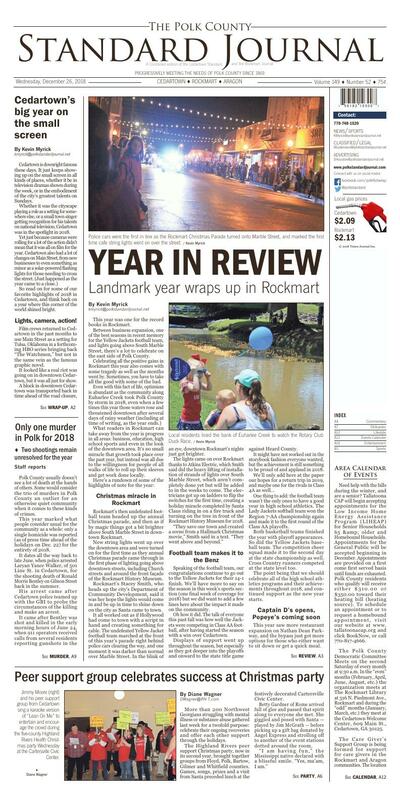 This year was one for the record books in Rockmart. Between business expansion, one of the best seasons in recent memory for the Yellow Jackets football team, and lights going above South Marble Street, there's a lot to celebrate on the east side of Polk County. Celebrating all the positive gains in Rockmart this year also comes with some tragedy as well as the months went by. Sometimes, you have to take all the good with some of the bad. What readers in Rockmart can take away from the year is progress in all areas: business, education, high school sports and even in the look of the downtown area. It's no small miracle that growth took place over the past year, but instead was all due to the willingness for people of all walks of life to roll up their sleeves and get work done locally. Rockmart's then undefeated football team headed up the annual Christmas parade, and then as if by magic things got a bit brighter above South Marble Street in downtown Rockmart. New string lights went up over the downtown area and were turned on for the first time as they annual Christmas parade came through in the first phase of lighting going above downtown streets, including Church streets and around the front facade of the Rockmart History Museum. Rockmart's Stacey Smith, who heads up the city's Department of Community Development, said it was her hope the lights would come in and be up in time to shine down on the city as Santa came to town. It all worked out as if Hollywood had come to town with a script in hand and creating something for cable. The undefeated Yellow Jacket football team marched at the front of this year's parade right behind police cars clearing the way, and one moment it was darker than normal over Marble Street. In the blink of an eye, downtown Rockmart's nights just got brighter. The lights came on over Rockmart thanks to Atkins Electric, which Smith said did the heavy lifting of installation of strands of lights over South Marble Street, which aren't completely done yet but will be added to in the weeks to come. The electricians got up on ladders to flip the switches for the first time, creating a holiday miracle completed by Santa Claus riding in on a fire truck and turning on the tree in front of the Rockmart History Museum for 2018. "They save our town and created a scene from a Hallmark Christmas movie," Smith said in a text. "They went above and beyond." Speaking of the football team, our congratulations continue to go out to the Yellow Jackets for their 14-1 finish. We'll have more to say on the season in this week's sports section (one final week of coverage for 2018) but we did want to add a few lines here about the impact it made on the community. Oh how it did. The talk of everyone this past fall was how well the Jackets were competing in Class AA football, after having started the season with a win over Cedartown. Displays of support went up throughout the season, but especially as they got deeper into the playoffs and onward to the state title game against Heard County. It might have not worked out in the storybook fashion everyone wanted, but the achievement is still something to be proud of and applaud in 2018. One thing to add: the football team wasn't the only ones to have a good year in high school athletics. The Lady Jackets softball team won the Region 7-AA championship again and made it to the first round of the Class AA playoffs. Both basketball teams finished the year with playoff appearances. So did the Yellow Jackets baseball team. The competition cheer squad made it to the second day at the state championship as well. Cross Country runners competed at the state level too. The point being that we should celebrate all of the high school athletics programs and their achievements throughout 2018, and continued support as the new year starts. This year saw more restaurant expansion on Nathan Dean Parkway, and the bypass just got more options for those who either want to sit down or get a quick meal. Asif Jariwala got to open his dream restaurant in Rockmart back during the summer with the help of his cousin Zaheara Momin. It was Jariwala's 12-year quest to bring Captain D's to Rockmart fulfilled, but that the new restaurant construction was completed right on time. Jariwala, who owns the Dairy Queen in Rockmart as well, said he bought the property with the hopes of bringing the seafood restaurant chain to Polk County way back in 2006. The restaurant opened up just ahead of the July 4 holiday for customers, who previously had to make a trek to Cedartown to enjoy the restaurant's seafood and chicken options. When Rockmart residents want to find out more about services the Polk County Sheriff's Office offers, they used to have to go all the way across Highway 278 to just outside of Cedartown, to the home of the Sheriff and the Polk County Jail within the Det. Kristen Hearne Public Safety Complex. Now they have a second option: stop by city hall. Sheriff Johnny Moats said back during the March opening of the new office that the satellite location allow residents who have business with the Sheriff's Office to come during their business hours to receive assistance. Moats added that a kiosk to allow relatives or friends of inmates incarcerated within the Polk County Jail can also deposit cash into accounts. A secretary is in the office Monday through Friday from 9 a.m. to 4 p.m., along with deputies as well. The office will be closed on weekdays for lunch. Those who wish to reach the Rockmart office can call 770-684-2724. The City of Rockmart played host to a number of festivals this year, rounding out the calendar with celebrations of Welsh heritage, enjoying Georgia Cities Week, the annual Homespun Festival in July, even gatherings in the fall for the annual Riverwalk Festival and the Festival of Treats at Halloween. Rockmart's participation in these events hit record levels for both vendors and attendees, even with sometimes less than ideal weather. All the events – starting with the WELSHFest in March – will be back in 2019. The city looks to keep seasonal events in place through the year in hopes of attracting tourism into the downtown area along with the utilization of the Silver Comet Trail. One area that will make it easier in the future to hold events is forthcoming developments for the Church Street Manor property. The hopes are that once plans begin to take shape and work on the acreage across from Seaborn Jones Park is completed, it will allow for an expansion of offerings when festivals come to downtown Rockmart. Isaac Streetman gets shot at fame on "American Idol"
A young man with a dream of making it big as a musician got a shot this year on the return of "American Idol" to television, and Rockmart's representative made it somewhat far. Streetman was one of many featured on the show, chosen by judges Luke Bryan, Katy Perry and Lionel Ritchie to take part in the 15th season of the revamped show on ABC. Streetman didn't win the big prize and fame and fortune he sought, but has since become a bit of a local celebrity. He's played at South Marble Coffee, local festivals and concerts, elementary schools and many more places in the time since. He even took part in the "Path to Fame" contest in Pigeon Forge, making it past auditions. Those who want to see him play can head on Jan. 4 to Sutton's in Carrollton, or visit facebook.com/theisaacstreetman to find out more about dates he has planned, see videos and much more. Earlier in the year, business owners in Rockmart who had for decades gathered together in the Rockmart Business Alliance decided that it was time to reorganize their efforts and merge with the Polk County Chamber of Commerce. The group announced the decision in their final meeting in April and voted to approve becoming the Downtown Rockmart Advisory Committee within the Chamber of Commerce, and act as ambassadors for the business community within the downtown area. One of the efforts the group undertook this year was providing financial assistance with putting up string lighting above the downtown area, and also to use leftover funds from the organization to get new signage. That project was set to extend into 2019, but is both a major initiative for both the committee and one the city also wants to undertake. It wasn't all roses and glory for Rockmart in 2018. At times, crime also made a big impact on the area and made the news in a big way. One of those cases from the year involved the April arrest of 21-year-old Quintin Ari Glover, who was accused during the spring day of robbing the Big Bear Convenience Store, then barricaded himself inside the Abundant Life Community Center not far away. He stayed in the building for several hours prompting authorities to call in SWAT team members from Rome to help close off the area and search the house. Glover later turned himself in without further incident. Police also noted a Rockmart-area shooting that has thus far gone without an arrest – at least based on the latest information available at press time. Back in September, a Decatur man was shot at a Pine Mountain Street address and drove himself to the Triangle Foods parking lot, where he later was taken to the hospital and treated. Polk County Police reported back then that 50-year-old Mallory McClarity had only been visiting the area when he was shot. One other area where people in Rockmart are trying to make a positive step forward is in helping the homeless population. Earlier in the year in April, the Rockmart Homeless Initiative opened out a resource center on South Marble Street, which has expanded to be open six days a week for people to utilize a variety of help. That includes food for those in need, clothing closets, a place to rest during the day if people are sick or stayed up all night, and even help in getting a state issued ID, one of the first steps toward finding permanent shelter and work. The RHI also earlier in the year received help from the City of Rockmart in providing a extreme cold weather shelter for homeless at the Hogue Avenue gymnasium. RHI has since partnered with the Abundant Life Community Center to provide shelter on extremely cold nights for this winter. Jimmy Moore (right) and his peer support group from Cedartown sing a karaoke version of "Lean On Me" to entertain and encourage the crowd during the five-county Highland Rivers Health Christmas party Wednesday at the Cartersville Civic Center. More than 200 Northwest Georgians struggling with mental illness or substance abuse gathered last week for a twofold purpose: celebrate their ongoing recoveries and offer each other support through the holidays. The Highland Rivers peer support Christmas party, now in its second year, brought together groups from Floyd, Polk, Bartow, Gilmer and Whitfield counties. Games, songs, prizes and a visit from Santa preceded lunch at the festively decorated Cartersville Civic Center. Betty Gardner of Rome arrived full of glee and passed that spirit along to everyone she met. She giggled and posed with Santa — played by Jim McGrath — before picking up a gift bag donated by Angel Express and strolling off to another of the event stations dotted around the room. "I am having fun," the Mississippi native declared with a blissful smile. "Yes, ma'am, I am." Highland Rivers spokesman Michael Mullet said that, for some in the peer support programs, the party is the only holiday connection they have. "Some have no family or they're estranged. Others may not have the resources," Mullet said. Through the peer support groups, people in recovery share their set-backs, their personal dreams of wellness and their coping strategies for dealing with stress. Each of the groups prepared a special presentation for the party. Early on, the familiar strains of Bill Withers' "Lean on me, when you're not strong ..." rang out as a karaoke production by the Cedartown peer support group. Brenda Byess called it their recovery anthem. "We lean on each other and support each other," she said as the singers waved homemade signs naming issues they each have risen above. At a nearby table, Michael Fears of Rome was filling out his Party People Bingo card — an icebreaker game that sent people off to find "a peer who likes to cook," "a peer who has been to a NAMI Walk" or "a peer who has gone Christmas caroling." The party grew more festive as raffle winners were called. "It helps," said Jimmy Moore, who's in the Cedartown program. "We get to know people who are going through the same challenges we are and see some we haven't seen in a while." Debbie Strotz, director of recovery-oriented care at Highland Rivers, has been in recovery herself for more than 23 years. She said it's a lifelong commitment that must be reaffirmed daily. "At the holidays, it's really important to know who your support group is," she said. Remembering to stay in the moment is another stress-reduction tip, Strotz said, adding that meditation has been helpful to her. And it's encouraging to enjoy a little holiday cheer with others who can relate to you. "The peers are the ones who show recovery is possible. They give hope to other people by showing it can be done," Mullet said. for the group is at Rockmart Presbyterian Church, 306 S. Marble Street, Rockmart. Call the church to learn more at 770-684-7289. The American Legion in Rockmart is hosting their monthly all-you-can-eat spaghetti dinner on Wednesday, January 9, 2019. Meal of spaghetti, meatballs, garlic toast and salad, $5. Join the group for a good meal and to support veteran and children's programs. The Legion is located at 1 Veterans Circle, Rockmart. Check back for any changes to the dates on the calendar in coming weeks. Rockmart Presbyterian Church is pleased to announce the expansion of its Music Ministry. First welcome Paul Campbell BM, MM, BD as Music Director and Organist, second the New Allen Organ in the Chancel and third, new program opportunities. The adult choir is accepting new members in preparation for its Christmas Eve program featuring "Christus Natus Est" by Cecilia McDonald. Sectional rehearsal are scheduled through the week. A new children's program includes Children's Choir on Wednesdays at 4 p.m. (FREE and open to all who wish their children to learn to sing). There will be an orientation meeting for parents and children on October 10 at 4 p.m. In addition to directing the new children's choir, Mr. Campbell will be offering Piano Lessons along with Shellee Wilson BM, BA, ME, will be offering singing/ vocal lessons. Private lessons have a monthly fee. For information to joining our music program please stop in and see Paul Campbell at Rockmart Presbyterian or call him at: 404-312-7801. The next West Georgia Spay/Neuter Clinic is coming to the Cedartown-Polk County Humane Society again coming up next Wednesday, Jan. 9, 2019. Head over to the organization's office at 608 Adamson Road, Cedartown, on Fridays from 4 to 7 p.m. or Saturdays from 10 a.m. to 1 p.m. to fill out an admission and prepay for the surgery. Those wanting more information can call 678-361-7304 for more information. Vaccines and tests are available for extra cost as well. Transports won't be scheduled again until Jan. 23, 2019. Harmony Baptist Church, 882 Little Harmony Rd, Cedartown (Esom Hill area) invites everyone to attend their weekly Sunday morning Services. First Sunday morning service begins at 9:45 a.m. with Sunday School followed by worship service at 11 a.m.. Our doors are open to all and we are looking Journal forward to seeing you. For more information visit our Facebook page, Harmony Baptist church, Cedartown. The Cedartown Optimist Club meets on Thursday mornings at 7:30 a.m. for their weekly breakfast meeting and encourages members to join in and take part at the Goodyear Civic Center on Prior Street in Cedartown. Those interested in joining the Optimist Club and help local youth organizations can contact Ronnie Dingler by e-mail at nmvideo@bellsouth.net. Cedar Lake Christian Center is a non denominational community who invites anyone looking to find the Holy Spirit within them to come join in worship services on Sunday mornings at 10:30 a.m. with the Rev. Neil Hopper, along with Hispanic services as well to the community. Those interested in participating can join in at Cedar Lake Christian Center, located at 1890 Rome Highway, Cedartown. For more information call 770-608-0651. The Polk County Beekeepers meets the first Saturday of each month from 10 a.m. to noon at the Cedartown Library, 245 East Ave. Whether you are an experienced beekeeper, new beekeeper or want to learn all are welcome. For details email polkcountybeekeepers@gmail.com or visit tinyurl.com/polkbees.